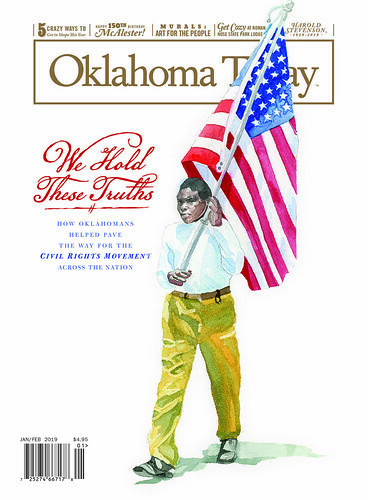 ON THE COVER: Oklahoma City artist Shannon Nicole illustrated this cover image of a young man at a downtown Oklahoma City Civil Rights protest in June 1963 from an Oklahoma Historical Society photo by Johnny Melton. From the earliest days of Oklahoma’s settlement, African Americans struggled to secure their civil rights in this land. From the Territorial Legislature through the Tulsa Race Massacre and the battles that integrated state universities, lunch counters, and schools, these brave men and women never gave up the hard work of justice. Now, a Tulsa writer and researcher collaborate to tell the story of the Civil Rights Movement in Oklahoma. In 2019, McAlester will celebrate its 150th birthday. Writer Robert Reid and photographer John Jernigan head southeast to find out what makes this fascinating little city tick. Public art has the power to turn walls into entire worlds and ordinary streets into entire worlds and ordinary streets into galleries. The nine murals in this portfolio—from Miami to Lawton and everywhere in between—show that art truly is for the people. Every January, would-be fitness buffs fill up gyms, hoping to treadmill and elliptical their way to better health. This year, instead of the same old slog, try out these unconventional classes, sports, leagues, and activities all over the state for a fat burn that’s actually fun. When he died in October 2018, Idabel native Harold Stevenson left behind a legacy as one of the most prolific, interesting, and important artists ever to emerge from Oklahoma. Though he named Andy Warhol, Jackson Pollock, and Yves Saint Laurent as his friends, his heart never left his hometown of Idabel. Roman Nose State Park Lodge is a worthy destination; staying inside isn’t so bad thanks to these new releases; Luxury Wellness and The Little Bubble are making baths the bomb; Ebony Iman Dallas calls on her family for inspiration; a stroll through downtown Edmond yields riches of all types; and although many fly south for the winter, these cold-hardy birds stick around. Dogs find their water legs thanks to The Water Bark in Oklahoma City; ahha’s The Experience exhibit in Tulsa delights the senses; KUCO in Edmond brings the classics to the masses; “Winter Highway” by Oklahoma City poet Richard Dixon takes flight; and the ABLE Commission explains the state’s new liquor regulations. In Tahlequah, a little shop called Morgan’s Bakery has been serving delectable treats for seven decades; Chew Your Own Adventure and find the best way to warm up from the inside out; and bologna may not be the fanciest of lunch meats, but Oklahomans sure do love it, especially at Smokin’ Joe’s Rib Ranch in Davis and Jamil’s Steakhouse in Oklahoma City.